Located at about 30 kilometres from Pune, the majestic Sinhagad fort on an elevated hill, 1,312 metres above sea level, is a major attraction for the trekkers, especially during monsoon. It’s a an hour and a half drive from Pune to Sinhagad via NH48. Once you reach Khadakwasla, keep driving along the water body until you hit a Y-junction at the foot of the hill. Then, drive straight towards the base village of Avtar Wadi! Your two-hour long trek to the top of the fort starts from here. 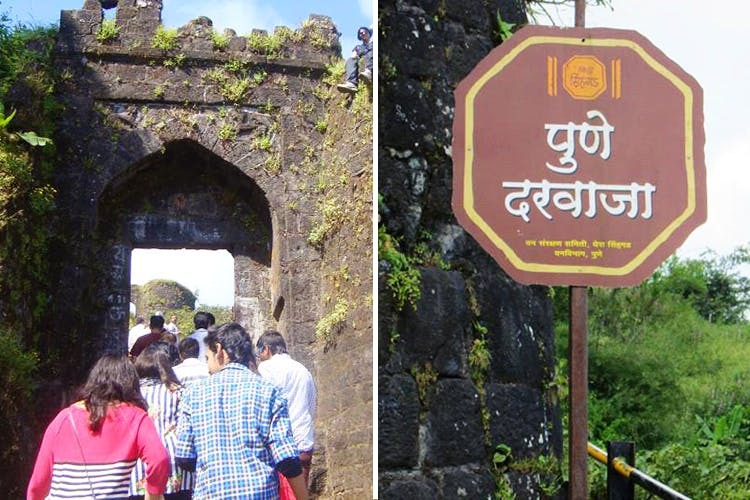 The trek to the hill fort is an easy climb through green thick shrubs, crumbling rocks, meadows and quaint kiosks serving snacks and tea at various corners of the trail. Once you reach the top, the view is spectacular. Make sure you visit the ‘kade lot’ point. History has it that convicts were thrown off from this particular edge of the cliff. That aside, you can still sit there with the squad, relax and witness the beautiful Khadakwasla lake all the way from the fort top, as it meanders away. Don’t forget to try the kanda bhajis, zunka-bhakar and fresh cold yogurt served at various food joints at Sinhagad. The trek to Sinhagad Fort is open all round the year. But rains somehow make the experience even more splendid. Tag the squad and hit the road to Sinhagad now. By the way, if you’re a fitness freak, this trek is an awesome way to shed some extra pounds.